The Cuisinart Crock Pot is programmable, which makes planning your meals even easier. This Cuisinart slow cooker has a 24 hour timer that will count down your cooking time and offers three different cooking modes. The pot automatically switches to warm when cooking is done. Perfect for soup, chili, a melt-in-your-mouth roast or even dessert, this slow cooker will make sure your food is done when you want it. The Cuisinart Crock Pot performs very well. With a full pot (or even half full) the device cooks slowly and evenly. The instructions warn to fill the pot adequately or the food can become overcooked. The construction is well done, using high quality materials. The ability of the slow cooker to shift automatically to warm is terrific, and can save you from overcooked or burned food if you are delayed in getting home for dinner. The new slow cookers bring food rapidly up to a safe temperature before settling in for the slow cooking. While the unit is a bit bulkier than other models, it is sturdily built. The handles on the insert are large enough to get a good grip on. The cord also retracts neatly into the body for storage. The additional rack is nice if you are making desserts or baking inside the pot. The unit looks nice out on the countertop. The Cuisinart Crock Pot has a plated chrome lid knob and handles. The lid knob's plating can bubble and peel off after a few uses, even with gentle handwashing. The lids can also rattle during cooking, which can be a minor annoyance. The pot does not have a delayed start program like others do, but there is some debate about the wisdom of leaving raw foods out at room temperature. The cookbook is adequate, but the recipes are a bit more complicated than merely putting ingredients into the pot and turning it on. There have been complaints that the high setting cooks too hot, leaving foods like dried peas, beans and lentils to turn into mush. The Cuisinart Crock Pot offers some programmability at a decent price. It looks great and performs well overall. If you are cooking softer foods like beans or lentils, you may need to watch it or turn it down at some point during cooking. The unit is easy to use. The 24 hour timer lets you set things up well in advance of your meal. The automatic switching to Warm protects your food and is very convenient. Be sure you have enough space on the countertop for this pot, as it is a little larger than some other models. 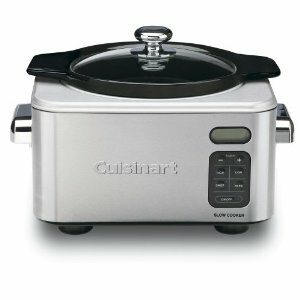 We found the Cuisinart PSC-400 priced from $99.95 to $79.95 online. Amazon was on the low end and offered free shipping with super saver shipping.